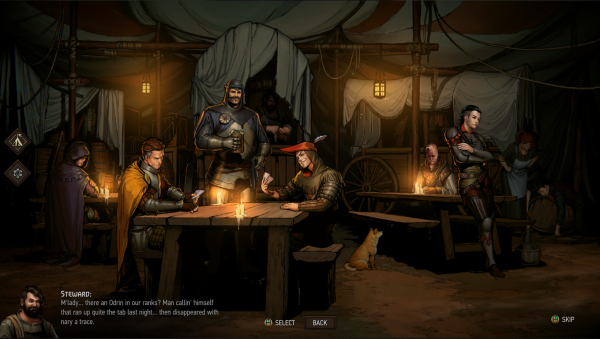 Thronebreaker: The Witcher Tales is CD Projekt Red’s latest game set in The Witcher universe. 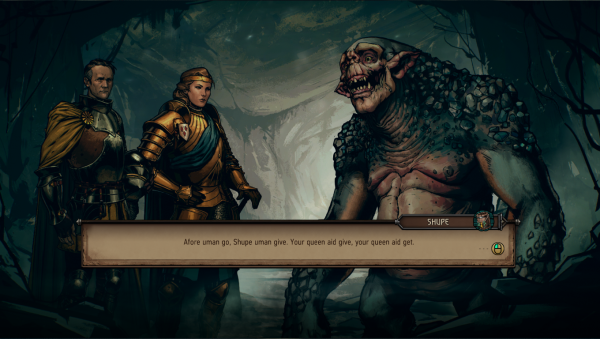 Thronereaker is a 30-hour long RPG that employs Gwent: Homecoming as its mode of combat. Whilst the game offers a short tutorial at the start, getting to grips with deck building and card synergy can be a little challenging. If you haven’t played Gwent or if you’ve only played The Witcher 3 version, it can take a while to get used to the new dynamics and meta of Gwent: Homecoming. You’ll also need to consider upgrading the various tents in your base camp, which companions to side with and how to tackle the various puzzles and battles on the map. 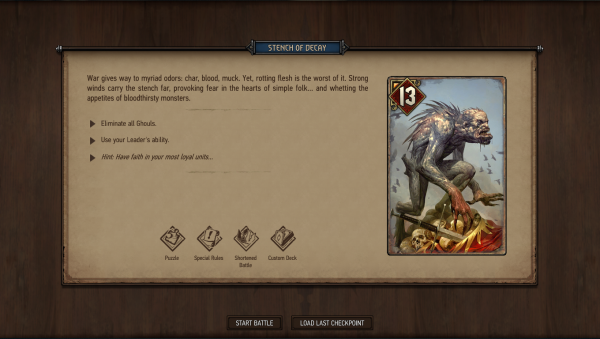 We’ve listed some tips for getting started and will elaborate on Gwent card synergy later. You can check out our review of Thronebreaker: The Witcher Tales here, as well as our guide to finding the golden chests in Lyria. Your base camp acts as your hub and inventory management screen. There’s a Royal tent, the Mess tent, the Command tent, the Training Grounds and the Workshop. Each element of the base camp can my improved upon, with various perks or items becoming available as you unlock each upgrade. The top right-hand corner displays the number of recruits you have, your resources and the amount of Gold you are carrying. You need to access the Workshop to make any upgrades. 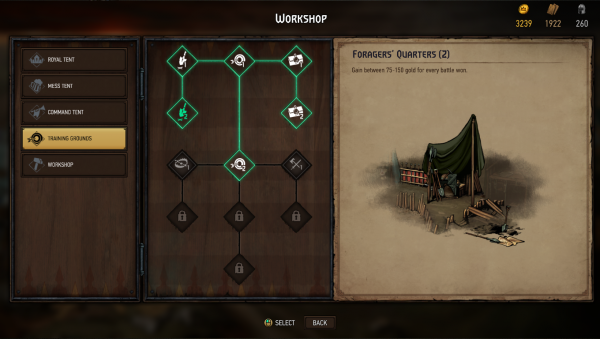 Your tents, or skills, are upgraded through a skill tree from each tents submenu in the Workshop, and the Workshop itself can also be upgraded. The Royal tent stores letters, keys, maps and quest information, and upgrading it will improve map visibility as well as allowing Meve to equip more Trinkets in battle, but more on that later. 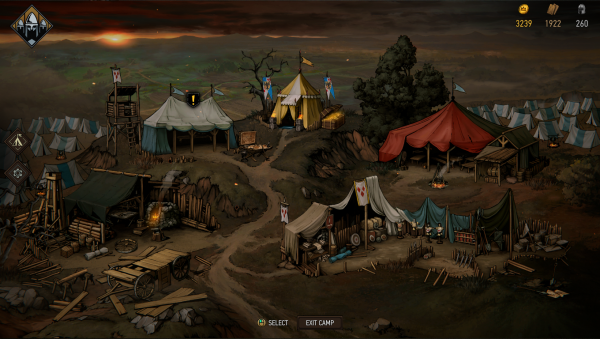 The Command tent, as the name suggests, is where you’ll decide what troops you want to use in battle. That is, what cards you want in your deck. Here, you can build your deck by using existing cards or creating new ones, which costs resources and gold. By upgrading the Command tent, you’ll be able to increase your recruitment cap which means you can have more units in your hand, as well as decreasing the cost of recruitment. Upgrading the Mess tent equally decreases the cost of having it, as you’ll want to expand it to allow for new companions. It’s a similar story with the Training Grounds; upgrading it will allow you to recruit more combat units, as well as earn more gold and gain more troops after each win. The Workshop can be upgraded to increase Meve’s movement across the map, as well as being able to recruit support units, alchemy and magic units engineering units. There are a tonne of loot points around the map and it’s important to pick them all up – really. You’ll need all the Gold, wood and recruits you can get your hands on to succeed in Thronebreaker, so it’s worth spending 50 Gold on Scouts to reveal all the loot drops in the world. Loot can be identified either by a hand icon on the map or above the item, as well as bright green ribbon on the item. Throughout the story, you’ll meet a host of new characters and some familiar names. Without spoiling too much for you, there will be named and voiced characters who will become available as Gold cards, and will be visible in your Mess tent. You’ll be able to interact with these characters at regular intervals, and you’re encouraged to do so to form stronger bonds with them. Anyone that ends up in the Mess tent is what we’ll dub a key player. The rule of thumb in Witcher games is to recruit everyone you meet, so it’s a good idea to recruit Black Rayla, Eyck, Isbel and Gascon as soon as you can. Be mindful of their intentions, however, as there is a general air of distrust and paranoia in the ranks. The key players each have their own tactics and style and will try to influence Meve to follow their lead. You can, of course, choose not to recruit them or, as I did, accidentally not recruit them by choosing the wrong option. There isn’t much scope to load back and try again in Thronebreaker, so choose carefully when deciding on who to bring for the ride. You’ll also encounter various NPCs that you can recruit to your army who aren’t key players, such as allowing peasants to join your ranks to spare them an untimely death or meeting the odd elf. Each interaction with a group of NPCs has consequences, immediate or not, with sometimes very positive or disastrous results for you and your army. If you complete a challenge in a town, win a battle or defeat a monster and there are NPCs lurking around, it’s worthwhile going back and engaging them in dialogue three or four times because there’s a chance they’ll come and join your ranks. At worse, they’ll belittle your previous choice with a dry quip. You’ll often see the phrase “You’ve chosen one evil in favour of another”, emulating the morally ambiguous nature of The Witcher universe. It’s even less obvious than in previous Witcher games which of the options is the “right” one, more so because you play as a monarch as opposed to a lone Witcher on the Path. 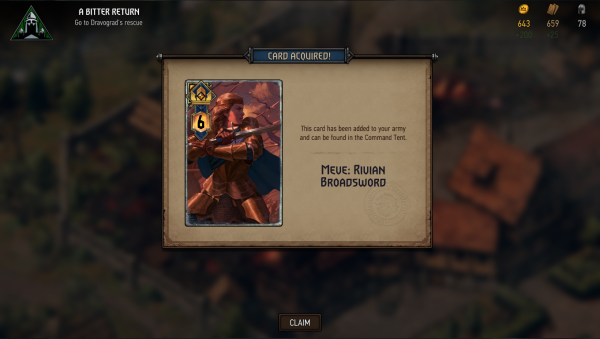 As previously stated, the version of Gwent that Thronebreaker uses is Homecoming, which is the base format of the standalone version of Gwent. Gwent, at its core, is a very simple card game wherein you have to beat your opponent’s high score. 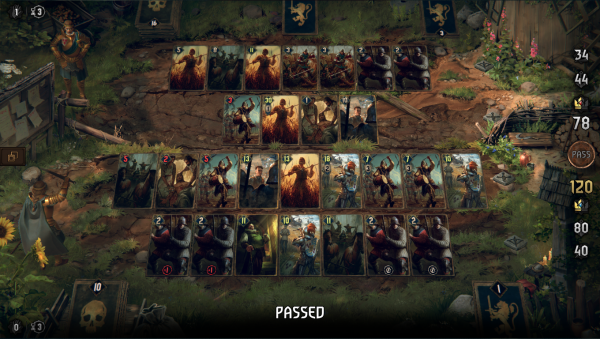 It’s a little different in Thronebreaker and you’ll need more than high-value cards to win. Gwent: Homecoming is starkly different from The Witcher 3 version. These cards have varying base values, as well as abilities. Some cards deal damage and others can be used for healing, as you’d expect. Others have a rechargeable ability, or one that stacks over time, and many high-value cards have recharge abilities. Meve also has Leadership abilities which can vary between boosting your allies power, damaging the enemy and moving cards around the board. The opening tutorial underpins the key concepts of Gwent in a very straightforward way, but what it lacks is an adequate explanation of how synergies work. It also doesn’t really explain the types of games you’ll have, namely battles, puzzles and random encounters. Many of these encounters will be a Special Rules game, where you’ll need to use a preselected hand, or choose cards out of a predetermined deck. There may also be specific instructions, such as not letting any cows die, defeat all foes or reduce all enemies to one health. Quite often, a Special Rules game will last one round, adding another layer of difficulty to the match. Meve has her own leadership ability and can also equip Trinkets to enhance gameplay, such as a runestone that deals high damage or a card that will heal your units and damage your opponents. There’s a fair bit of freedom to pick and choose what cards you want to use to best fit your style of gameplay. The puzzles appear to be the most challenging element of the game, mostly because of the reliance on synergy to try and trip you up. Unlike many other puzzle or card based games, none of the cards in your hand are a ruse. There has only been one match where I have not used every card in my hand, so don’t disregard a card just because it appears to be useless. It is important to read and understand the use of every card in your deck. One of the most common cards you’ll see in a puzzle is the Wagenburg, so here’s a brief example of how you could use it in a puzzle. Say you had an enemy with health value of 11 and the Special Rule was that the enemy had to be eliminated. Your predetermined hand includes the Wagenburg, a War Wagon, and Reynard. Once a Wagenburg is played, every time another card plays on this row, it will gain one armour and one damage point. Ergo, the more cards you play on that row, the higher the damage it will do. You would then play the War Wagon, which pulls two low-value Light Infantry cards from your deck and plays them. By now, you there are four cards on the board and the Wagenburg will now have a damage value of three. You might be wondering at this point how you intend to damage your opponent at this point. If you look again at the Light Infantry card, you’ll see that it has a Deathwish perk, when upon being killed, it will inflict five damage points on an enemy. You are able to use a cards perk, such as stacked damage, at any point during a round and if you have a recharge power like your Reynard card does, it is wise to use the power first, then deploy the recharge card to use it again. So, what you would do is use the Wagenburg’s three damage points on your own row, destroying the two Light Infantry. These will inflict 10 damage on your enemy. You would then play Reynard, who would give the Wagenburg one damage point and recharge its damage ability. You would then use that remaining damage point on the enemy and win the match. The solution to various battles or puzzles may not be obvious the first time around, but with practice, you do pick up the knowledge and experience to work out what you need to do. CDPR have really pulled off something quite unique with this style of combat. 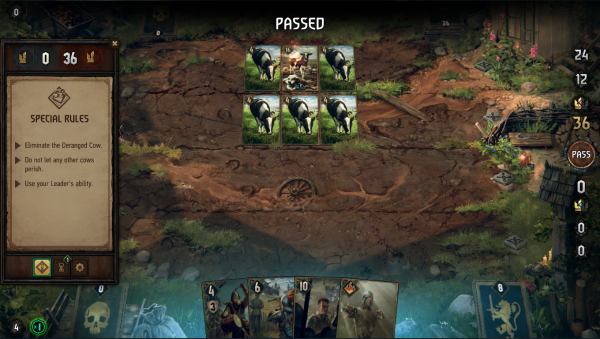 There’s a real subtlety to Gwent in Thronebreaker, with card choices and layouts that aren’t as they appear and forcing you to think quickly in order to defeat a boss. And believe, there will be a lot of defeats, which makes the resulting victory even sweeter. Thronebreaker is out now on PC, PS4 and Xbox One.